Identification: This is an elongate, lemon yellow dorid with faint brown spots, a rigid body and large spiculate tubercles. Natural history: Aegires pruvotfolae is a moderately rare species found under rocks in moderately protected to moderately exposed rocky habitats at depths of 4-12 m (13-40 ft). 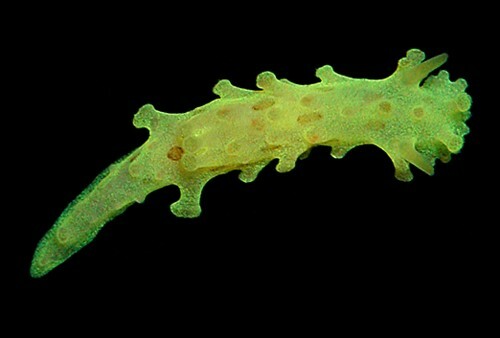 It is usually closely associated with a tiny calcareous sponge that is the same size and color as the dorids suggesting that it's their food species. An animal about 7 mm in length laid a yellow, spiral egg mass that hatched in 8 days in the laboratory. Distribution: Big Island, Kauai, Maui, Maro Reef and Midway: widely distributed in the Indo-Pacific. Taxonomic notes: It was first recorded in Hawaii by Terry Gosliner and was formerly referred to as Aegires citrinus. Photo: CP: 7.2 mm: Kapalua Bay, Maui; March 27, 2007.